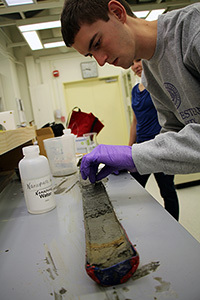 The Quaternary Sediment Lab is devoted to analyzing sedimentary records of Quaternary environmental change, with a focus on paleolimnology. The lab is equipped with a cold room for long-term sediment core storage; equipment for sediment core splitting and logging; and instrumentation for magnetic and geochemical analyses of sediments. The lab's microscopy facility is devoted to paleoecological analyses.